CES 2015 is officially over but that doesn’t mean people will stop talking about it anytime soon. CES is such a huge show that spans not only the Las Vegas Convention Center but multiple hotels along the Vegas strip. As a result, there are too many exhibitors to mention something from all of them but there are some noteworthy ones. There were also some trends that we saw in what was popular at CES and what we might see in the very near future at an electronics store. One of the most popular trends we saw at CES this year was the one of smart cars or connected cars. There were several auto manufacturers out showing their latest technology. BMW, Audi and Mercedes were the most notable of those manufactures with Audi sending an A7 self-driving car prototype from LA to Las Vegas. Not to be outdone BMW demoed an i3 driving and parking on its own in a parking garage on the Vegas strip while Hyundai and Volkswagen were also among those that had self-parking cars. That wasn’t all they had though, there was BMW’s ability to connect to your Samsung smart watch and drive it with that. There was Nvidia’s booth showing both the Drive CX and Drive PX hardware and software that they hope will be powering the next generation of smart car. Mercedes showed a full on connected car of the future, the F 015 Luxury in Motion Concept that will undoubtedly trickle down technology and features to cars the public can buy. CES being CES there were a ton of wearables on display and out on the show floor for demoing. One of the stars of the show was the Withings Activite Pop with its classic analog face and $150 price tag, it’s easy to forget the fact that it is a connected smart watch made in Switzerland! There was some new focus on the minds health and not just the body at CES as there was another interesting wearable featured at CES called the Thync. It’s a mood altering wearable developed by a group of Harvard Neuroscientists and all you had to do was place the device on your temple and wait 20 minutes or so till you felt energized or sleepy. Zensorium is another company that debuted a product with a more holistic approach with their product called Being. The device monitors your body’s stress levels as well as your mood. The Being also features standard issue activity tracking and sleep tracking modes as well. 2015 may well be the year that wearable become really mainstream, there were no less than nine major manufacturers of either electronics, jewelry or accessories debuting new entries into the wearable market this year at CES and that isn’t counting the smaller crowd funded or smaller newcomers to market. 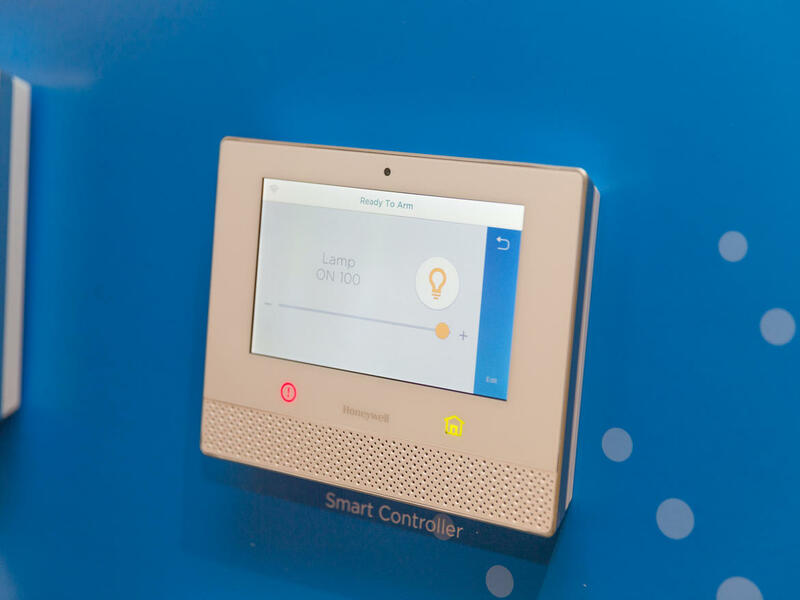 The smart home received lots of love from CES this year with lots of different products aiming to both simplify and reduce energy usage by making our homes more connected. A big proponent of the smart home and DIY lifestyle is Lowes who was out in force with a huge smart home mock-up. The display featured many different products from companies they carry as well as the Iris smart home products exclusive to Lowes. Parrot, a company famous for its Zik headphones and quad-rotor drones displayed a Bluetooth connected flower pot called Parrot Pot. Parrot Pot has a reservoir large enough to water a plat for three months and it measures fertilizer, moisture and ambient light. Netamo debuted a security camera for your home that actually uses facial recognition to recognize who is home and if it’s an intruder. The Netamo Welcome broadcasts footage live while storing who it identifies and records on an SD card. Honeywell is showing that they want to be a player in the smart home market with the new Lyric Security System. Honeywell introduced the Lyric smart thermostat last year and is taking a bigger step forward into home automation for the masses. The wall mounted LCD touch screen can work with other companies’ hubs and devices so mixing and matching preferred devices is OK. This year the biggest trends were the usual suspects with Wearables, Smart Car and Smart home. It’s not really any surprise these were the most popular though, they are the areas of technology that can use the improvements and have the room to do so. They also will reach the average consumer easier and therefore will be the most profitable. The product we covered here only scratch the IoT surface and in the coming week we will be reviewing some other hot products from CES.